Ed Vallee, head meteorologist at Vallee Weather Consulting, has certainly been on his weather game this year. Last month, his forecasts correctly pointed to a number of cross-country storms and unprecedented cold weather that punished the East Coast. Now, his forecasts point to a new danger. Winter Storm Diego will travel through the southern US with a swath of snow, sleet and freezing rain from the southern Plains to the Ozarks, southern Appalachians, and parts of the Mid Atlantic late this week into early next week. A winter storm will take shape across the Four Corners region of the U.S. late this week, and will move across the southern tier of the United States into the weekend. This sets the stage for an impactful early season storm in areas that typically don’t receive abundant winter weather. Snow and ice will impact the Panhandle of Texas and western Oklahoma Friday night into Saturday. As it moves eastward, it will pick up Gulf of Mexico moisture and allow for heavy snow and ice in the western Carolinas and western Virginia along the I-81, I-77, and I-85 corridors Saturday night through Monday. 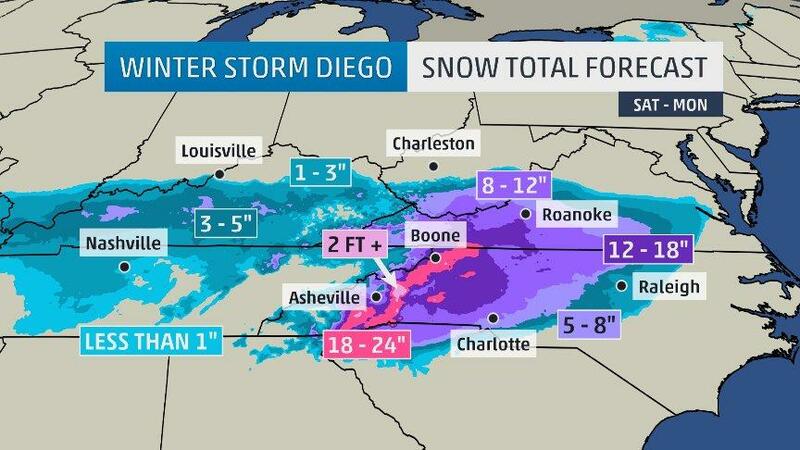 This looks to bring wintry impacts to cities such as Charlotte, NC, Raleigh, NC, Roanoke, VA, and Asheville, NC - all areas that typically average 14 inches of snow or less (all except Roanoke, VA average less than 7 inches) per year. 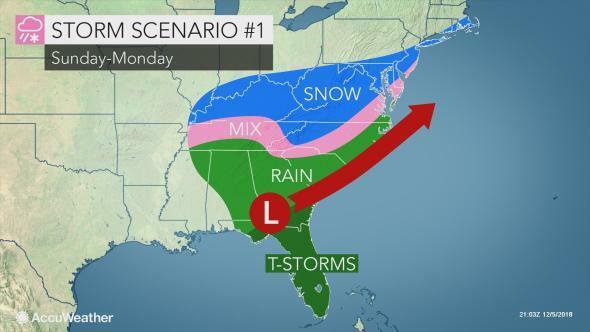 This storm may provide those amounts or even more, particularly in areas west of I-77 in North Carolina, and along the I-81 corridor in southwest Virginia, said Vallee. 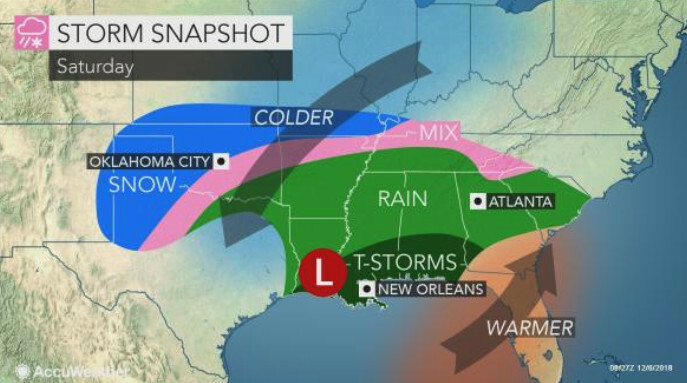 Rain, thunderstorms and wintry participation are expected across the southeastern US on Saturday. 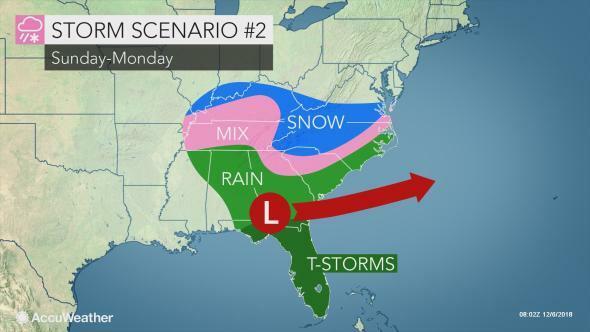 The storm is likely to "pack quite a punch in the South Central states this weekend," said Accuweather, adding that "it may hit like a sledgehammer over portions of the Southeast states from Saturday night to Monday." 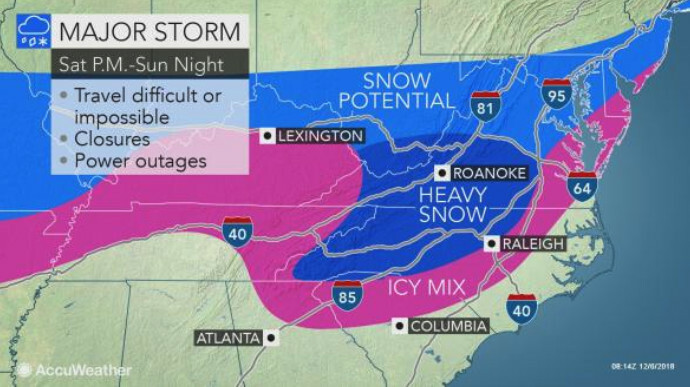 This may be a historic storm in parts of NC and VA this weekend. European ensemble data is suggesting a wide area of 12"+ of snow, which is more than the seasonal normal snowfall in many areas outside of the mountains. "In areas from the mountains of western North Carolina to parts of southern West Virginia and western and central Virginia, this will be a major storm with the potential for a foot or more of snow," according to AccuWeather Senior Meteorologist Brian Wimer. This massive storm also has the potential to bring an icy mix to the Delmarva Peninsula. Sleet and freezing rain can be extremely dangerous and could complicate driving conditions on the I-95 across the Baltimore–Washington metropolitan area. Heavy wet snow and icy conditions are anticipated to bring widespread power outages across the affected areas. 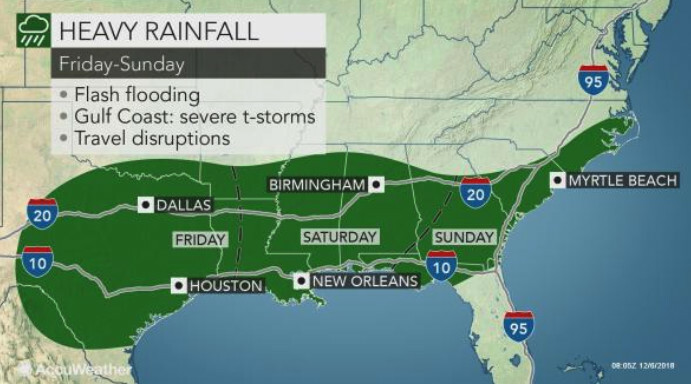 In the Deep South, there are risks of severe storms, flash flooding, and travel disruptions in the I-10 and I-20 corridors of the Southeast, as well as in the coastal areas of the Carolinas and the southeastern corner of Virginia. What is social media saying about Diego? let's get one thing straight. I've got plans this weekend, and you're not invited. is going to affect Texas in the upcoming weekend. ?? So far customer service unwilling to do preventative itinerary changes.